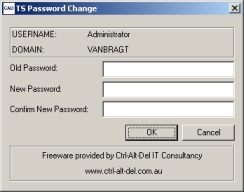 The people behind CTRL-ALT-DEL created a several tools that helps you adding additional functionality to the login scripts. With QRYPUBAPP you can query the name of the Published Application that the user is starting. The command QRYPUBAPP [published application name] for example QRYPUBAPP Notepad. If the Published Application name can be found the query will give an errorlevel 0 or if not found an errorlevel 1. Using this is your loginscript you could make IF statements launching additional command like copy an INI file or setting a registry key like the example below. A similar tool is QRYDEPTAPP, where you can check on the latest part of the name of the published application. CTRL-ALT-DEL suggest to use department codes. For example Desktop_Sales or Desktop_Administration. With QRYCLIENTIP you can check (a part of) the client IP address. The tools can be used to check the whole IP-address or a part of the IP address. If the parameter after the command matches the real IP just like the other tools an errorlevel 0 will be generated, while a non matched parameter will give an errolevel 1. This can be useful to connect for example printers into the session based if you have subnetted your network infrastructure. The command is QRYCLIENTIP [IP_part1] [IP_part2] [IP_part3] [IP_part4] for example QRYCLIENTIP 192 168 77. If you do not use Citrix, but the RDP protocol you should use the tool QRYTSCIP. Beside the (login) script additions CTRL-ALT-DEL also provides some tools to support your helpdesk. With WHEREIS the helpdesk can easily find the user in your Terminal Server. WHEREIS searches all the Terminal Servers to find the specified user (as parameter) in your infrastructure. A nice tool for (scripted) maintenance on your Terminal Server is TSLOGOFF. This tool extends the default logoff.exe provided by Microsoft. Additional features are the possibility to specify that you can logoff all sessions or all disconnected sessions from the specified server. Because you can use this logically in scripts you can automatically log off all sessions followed by your maintenance script. 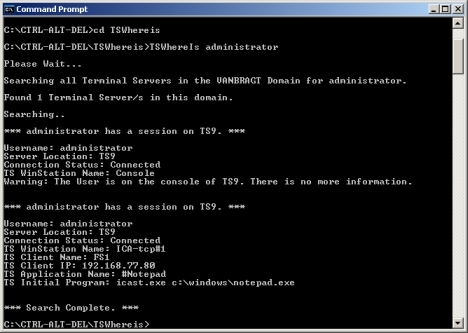 The command is TSLOGOFF [sessionid/ALL/DISC] [/SERVER:TSServer_name]. CTRL-ALT-DEL latest tool is BOMPROF. BOMPROF is GUI based utility that show all profiles (local or roaming) on the server and if they are in use or available to copy or delete. You need to have local administrator rights to perform the delete or copy actions, so the tool is most useful to see easily to see if the profile is not locked. CTRL-ALT-DEL consultancy most well known utility is TSPassChg. With TSPassChg you can provide your users with a separate tool to change their password using a Terminal Server application. You definitely need this tool if you are offering only published applications and the workstations (like Thin Clients) are not a member of your domain. The only thing you need to do is copying the executable on your Terminal Server(s) and publish this executable as published application. CTRL-ALT-DEL is one of the consultancy firms that developed several nice tools to extend standard terminal server functionality. CTRL-ALT-DEL well known application TSPassChg is a most to add to your environment if you are using Published Application. I personally find WHEREIS and QYRCLIENTIP also very useful for several scenarios. The CTRL-ALT-DEL tools can be at their website.